Another great visit from Chris. He’s someone you could trust to do anything. Thanks again. We enjoyed working with your guys to do our kitchen. Thanks for all your care and planning in actually making this dream come true. I absolutely love the style and color of my cabinets. The handles definitely complete the deal! We are so glad you straightened out the cabinet drawers and granite. Everytime I walk into the kitchen I am greeted with such a nice surprise. Thanks again for being understanding and patient with us. Steve and Dana could not have been more helpful and amazing through the entire process!! Beautiful craftsmanship and affordable prices!! Skip the big box stores and shop local. They made our tiny kitchen with no space, into a dream kitchen that looks and feels so much much bigger! You will not be disappointed choosing Dickerson!! Thank you for doing a great job! We love them! Thank y’all so very much! I just wanted to send you a picture of our finished kitchen. 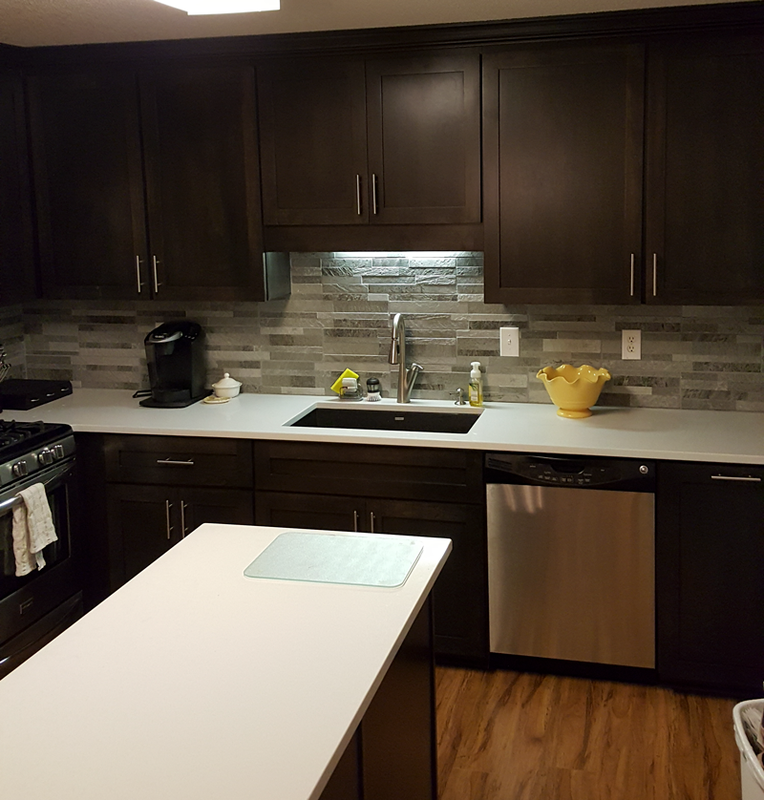 We finished the backsplash this weekend to complete the makeover. Please share with everyone and know that we couldn’t be happier with the finished product. The cabinets are beautiful!! Thanks again!! Thanks guys! Love my cabinets! Chris is awesome! Thank you, we love the cabinets and we really appreciate your guys…Justin and the other young man. Both did an outstanding job. I hope you appreciate how well they represented not only themselves but to you and your company, we couldn’t be happier. Ken and I want to personally thank you for the beautiful cabinets in the new home. The custom detailed craftsmanship is just what we expected. It was a pleasure to work with you and your employees. Dana, Chris and Justin are exceptional employees that take pride in their work, aiming to please the customers, and always in a professional manner. They should be commended for their efforts. Thank you again Steve. We’re very happy. With our new cabinets we have a beautiful home to enjoy for many years to come. I just wanted to thank you both for all your assistance during this process. It was such a delight working with you. All of the cabinets are absolutely gorgeous! And, you must come see my kitchen! Again, thank you so much! I look forward to working with you again in the very near future (laundry room). Everyone loves my kitchen, so you’re getting some good advertisement; but most importantly…I love my kitchen! It’s so much easier to work in there now, and the custom table is absolutely PERFECT. For the first time in more than ten years, I actually like to cook for family & friends…THANK YOU!